Eastnor Castle01531 633160work CastleEastnor Castle is a fairytale Georgian castle, dramatically situated in the foothills of the Malverns. 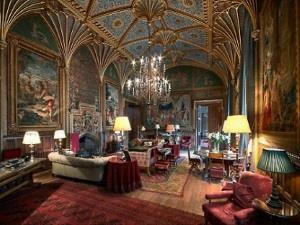 Set in an Area of Outstanding Natural Beauty and surrounded by a deer park, a mature arboretum and lake, Eastnor Castle boasts beautifully restored interiors containing medieval armour, tapestries and Italian furniture and fine art. We welcome visitors on the following days from Easter until the last Sunday in September. Guided Tours: Must be pre-booked on Mondays & Tuesdays throughout the year subject to availability. A free admission ticket will be issued to the group organiser and the driver will receive free entry. (Discounted membership cards for example HHA or English Heritage are not valid for a pre-booked guided tour). Self-guided: Any Visitor Open Day. Valid for 1 year and includes all Castle Visitor Events (does not include theatre productions & Deer Park Events).